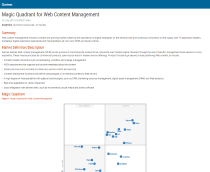 Consuming and controlling content over multiple digital channels is difficult to do without the implementation of Web Content Management (WCM) systems. These tools offer a high degree of interoperability and provide real-time adaptation to visitor interaction so companies can free up their time and ensure they’re getting the job done right. The Gartner Magic Quadrant applies a uniform set of evaluation criteria and uses a culmination of research in a specific market to offer you a wide-angle view of the market’s competitors.